Description: The XTend Modem packs a ton of RF punch into a small, low-power, easy-to-use, and reliable module. Outdoors, with line-of-sight, this module can communicate at up to 40 miles; indoors it can still do up to 3000ft. 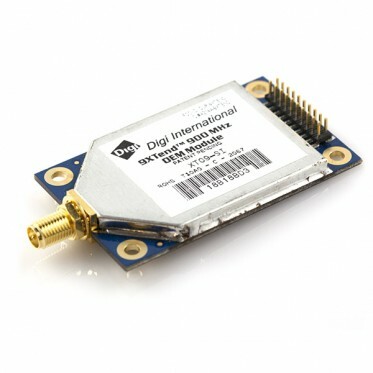 The module transfers a standard asynchronous serial data stream, operates within the ISM 900MHz frequency band and sustains up to 115.2kbps data throughput. The module comes with an attached RPSMA antenna connector. The XTend module utilizes FHSS (Frequency Hopping Spread Spectrum) agility to avoid interference by hopping to a new frequency on every packet transmission or re-transmission. Its transmit power is software adjustable from 1mW to 1Wthe maximum output power allowable by governments that use 900MHz as a license-free band. The XTend module is approved for use in the United States, Canada, Australia and other countries (contact Digi for a complete listing). No configuration is necessary for out-of-the-box RF communication. The XTend modules default configuration supports a wide range of data system applications. Advanced configurations can be implemented using simple AT or binary commands.